Regarding the following (b) And then being stopped out on the remainder, why did you not get back in? There’s a beautiful re-entry just after 14:00. Since the swing low at 864 (that lead to the high at 870) was broken after the strong move down and the retracement back up to 864 looked weak, would it be wrong to say there was an objective trend change to the downside that might stop one from taking longs? 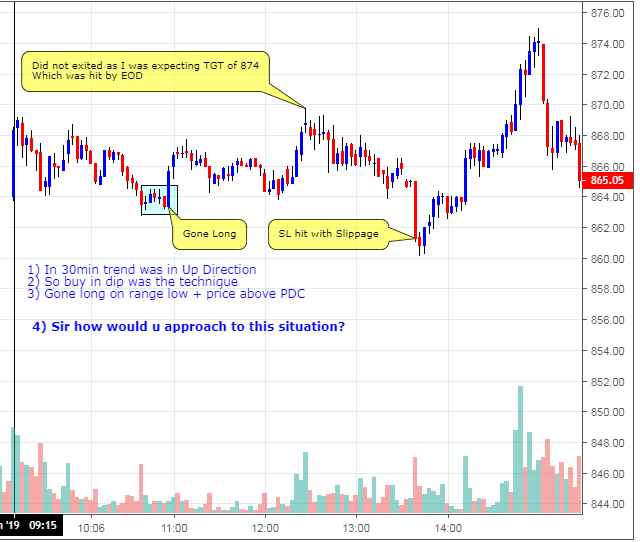 Just firstly, the trader discussed is not trading the YTC method. Most of my readers aren’t (I’m crap at marketing and selling, I guess). Unless I completely misunderstood his Q&A, he’s attempting to find a structural entry LONG in the direction of the higher timeframe trend. So from his perspective there is never a short opportunity. There is only a re-entry LONG opportunity when the move below the range boundary fails. But let’s look from the YTC PAT perspective. I would have absolutely no problems with someone looking for entry SHORT at this point you identified. I would be myself. The structure up until the break down was a sideways trend between 864 and around 869. The break below 864 was with strength. And price held below that level long enough for me to say that we have price acceptance and the trend is down. So I’d be seeking breakout pullback opportunity SHORT during the weaker retest of 864, exactly as you suggested. As we see though, with the benefit of hindsight, any entry SHORT would have stopped out as the breakout move fails and price re-enters the sideways range. There are two outcomes then for someone who did enter SHORT. (a) Take the stop out, reassess and wait for the next opportunity. Or (b) take the stop out, but recognise that the change of structure from downtrend back to rangebound sideways trend represents opportunity immediately, and therefore enter LONG. This entry LONG is far more aggressive. And hard to do, given you’d just have taken a loss SHORT. But it was there for anyone who recognised it. Of course – as mentioned in the article – this is not my market and so all my comments are made with the benefit of hindsight. Would I have been alert enough to recognise entry LONG? Who knows? I’d like to think so. But would I have any problems with anyone looking for a SHORT here and failing to catch the LONG? Not at all. They take a small loss. Move on. Thanks for the reply. I guess I always think most of the readers are YTC traders. And I agree with the failed short – reassess and adjust my bias as needed. I don’t know if I’d be quick enough to get long right away here, but I’d be looking for weak pullbacks to go long, waiting to see what happens if price moves back to the upper edge, etc. 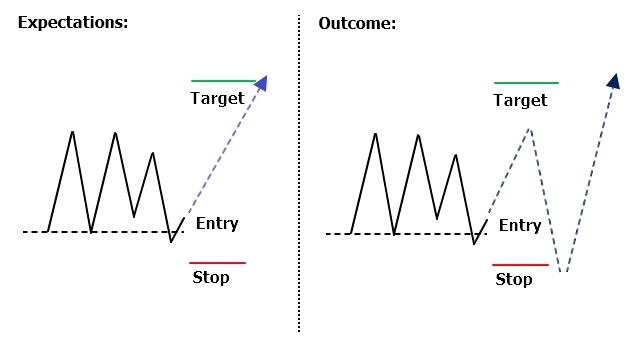 Targets are useful first of all to estimate Risk/Reward of a trade to see if it’s even worth pursuing it, secondly to ensure profits are maximized by exiting while there is still momentum in our favor. The second point I mention above, is key and should be stressed in my opinion: *a trade is a good idea only as long as momentum stays favorable to it. Not one tick longer than that*. Following the above principle: I set my target and initial stop, then I trail that initial stop using the higher time frame candles as they develop. The idea is, assuming a LONG position: as long as there is strong momentum in my favor, the candles in the higher t.f. will show higher highs and lower lows. so, every time a new candle in the higher time frame forms with a higher high and higher low, my stop gets updated to sit just one tick below the low of such candle. If no higher high is formed, I won’t touch my stop and wait for momentum to either resume or stop me out. If a candle forms a lower low in the higher t.f. : momentum is becoming too weak for me to still hold my position until it hits the target I set. So, I want out – which is accomplished by my stop trailing process. My time frames, these days: 1 min for the trading time frame, 5 min for the higher time frame (the one I use to trail my stops), and 60 min for my “long term” trend assessment time frame. Thanks for sharing that. The simplest tools are often the best. And trailing a stop via any higher-timeframe candle which makes a higher high & higher low, is about as simple as it can get. And quite effective at identifying loss of momentum. It’s a nice compromise between “close enough to not give back too much” but not “too tight that it stops out while momentum is still in play”.